In this case, as shown in following picture is COM1 available, now you can connect the Weavefuture Coin Acceptor AK5’s RS232 cable (this cable is specially made for AK5, do not use it for other device or use other RS232 cable for AK5, do so may cause damages) to the COM1 port of your PC. There are few version of USB driver for AK5-USB, if you do not know which one, you can install all of them. This USB driver can be used for both coin acceptor and bill acceptor. 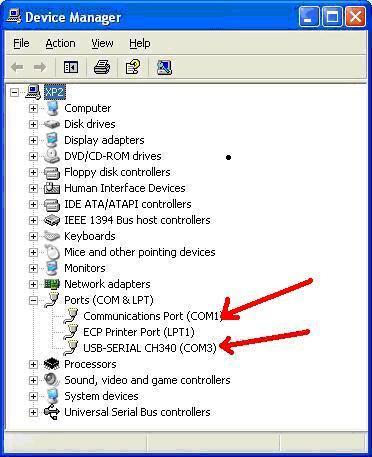 double click the selected com port for example COM3 in the above picture. "port setting"->Advanced->change the Com Port Number to any other available number->OK. A.	Login Windows 2000/XP as a user of Administrator. C.	Download software from http://www.weavefuture.com/download/coi ... etimer.zip or you will be informed the detail URL location after you purchase the Weavefuture Coin Acceptor AK5 System. Do not change the software's setting from test to production until you have hardware Weavefuture Coin Acceptor AK5 configured and attached the its RS232 Cable to the right com port of you PC (default COM1), otherwise it may cause you PC to locked and you have to reinstall Operation System. D.	Click extract zip file to CoinOpInternetCafeKioskSoftware.msi. F. Following the default setting until finished the setup. G. Reboot your PC after the software installed. The Com port is default COM1. The Com Port default is COM1; you may change it to match your PC’s Com port, which attached the Weavefuture Coin Acceptor AK5. This is only for advance user. •	Press the Adjust Setting Switch to adjust the coin value in turn and let the LED display the value, which want to erase. Example A : Setup for Canadian Nickel(0.05), Dime (0.10), Quarter(0.25), Loony($1.00), Toony ($2.00) output pulse only up to 0.25. 1. Clear all the settings. Following steps 1 or 2 to erase previous settings. 2. Prepare 10 Canadian Nickels, 10 Canadian Dimes, 10 Canadian Quarters, 10 Loonies, 10 Toonies. 7.	press Adjust Setting Switch once, the display will show “03” which stands for Coin ID=3 in PC, drop the 10 quarters in sequence, when drop the 10th quarter, the display will show “F” means the setting is done. 8. Press Adjust Setting Switch 3 times until the display show “04” which stands for Coin ID= 4 in PC, drop the 10 Dimes in sequence, when drop the 10th Dimes, the display will show “F” means the setting is done. 9. Press Adjust Setting Switch 4 times until the display show “05” which stands for Coin ID= 5 in PC, drop the 10 Nickles in sequence, when drop the 10th Nickles , the display will show “F” means the setting is done. 10. Turn Setting Switch to START, then your AK5 is ready to use. 6. Turn Setting Switch to START, then your AK5 is ready to use. Example C : Setup for Pound (£2.00), Pound (£1.00), Pound (£0.5), Pound (£0.20), Pound (£0.10). 1. Clear all the settings. Following above steps 1 and 3 to erase previous settings. 2. Prepare 10 sets of Pound (£2.00), Pound (£1.00), Pound (£0.5), Pound (£0.20), Pound (£0.10)s.
7.	press Adjust Setting Switch once, the display will show “03” which stands for Coin ID=3 in PC, drop the 10 Pound (£0.50) in sequence, when drop the 10th Pound (£0.50), the display will show “F” means the setting is done. 8. Press Adjust Setting Switch 3 times until the display show “04” which stands for Coin ID= 4 in PC, drop the 10 Pound (£0.20) in sequence, when drop the 10th Pound (£0.20), the display will show “F” means the setting is done. 9. Press Adjust Setting Switch 4 times until the display show “05” which stands for Coin ID= 5 in PC, drop the 10 Pound (£0.10) in sequence, when drop the 10th Pound (£0.10), the display will show “F” means the setting is done. Example D : Setup for Euro (€2.00), Euro (€1.00), Euro (€0.5), Euro (€0.20), Euro (€0.10). 1. Clear all the settings. Following above steps 1 or 2 to erase previous settings. 2. Prepare 10 sets of Euro (€2.00), Euro (€1.00), Euro (€0.5), Euro (€0.20), Euro (€0.10)s.
7.	press Adjust Setting Switch once, the display will show “03” which stands for Coin ID=3 in PC, drop the 10 Euro (€0.5) in sequence, when drop the 10th Euro (€0.5), the display will show “F” means the setting is done. 8. Press Adjust Setting Switch 3 times until the display show “04” which stands for Coin ID= 4 in PC, drop the 10 Euro (€0.20) in sequence, when drop the 10th Euro (€0.20), the display will show “F” means the setting is done. 9. Press Adjust Setting Switch 4 times until the display show “05” which stands for Coin ID= 5 in PC, drop the 10 Euro (€0.10) in sequence, when drop the 10th Euro (€0.10), the display will show “F” means the setting is done. Example E : Setup for AUD (2.00), AUD (1.00), AUD (0.20), AUD (0.10), AUD (0.05). 2. Prepare 10 sets of AUD (2.00), AUD (1.00), AUD (0.20), AUD (0.10), AUD (0.050)s.
7.	press Adjust Setting Switch once, the display will show “03” which stands for Coin ID=3 in PC, drop the 10 AUD (0.20) in sequence, when drop the 10th AUD (0.20), the display will show “F” means the setting is done. 8. Press Adjust Setting Switch 3 times until the display show “04” which stands for Coin ID= 4 in PC, drop the 10 AUD (0.10) in sequence, when drop the 10th AUD (0.10), the display will show “F” means the setting is done. 9. Press Adjust Setting Switch 4 times until the display show “05” which stands for Coin ID= 5 in PC, drop the 10 AUD (0.05) in sequence, when drop the 10th AUD (0.05), the display will show “F” means the setting is done. We also have another version of USB-RS232 driver. Use this one if you purchased recently. It states to follow steps 1-3 to reset to default but steps 1-3 are installing the driver and software, so how do you reset to default??? Anyone else encountered this problem? I've now "bricked" 2 PC's and had to reinstall windows on both. following part is missing when the website is updated.